Fully test windings for any possible problems using the industries top equipment. Once unit is approved for rewind, full schematics will be produced to ensure every aspect of the windings is replicated using top materials. The unit will then be stripped of the old copper using a cold stripping method to ensure preservation of the laminations. Beginning the winding process includes spraying the laminations with varnish and inserting insulation exceeding manufacturer specs. Coils are then wound on a computerized winding machine to ensure proper wire layering form. 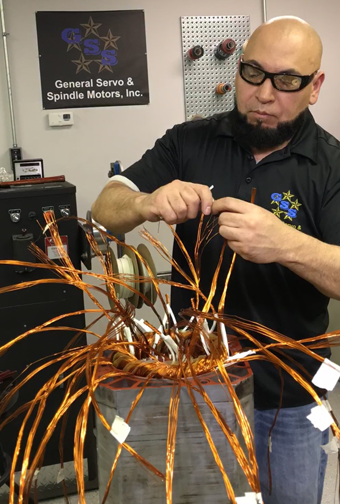 Once all the coils are inserted a full connection of the coils will take place replicating factory data. Full testing of the windings will take place before the unit is ready for varnish coating. General Servo offers Winding Encapsulating to customer requirements.